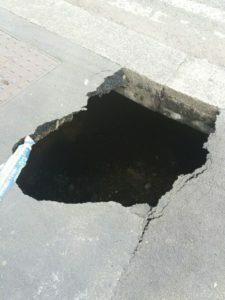 Police are looking into a deep hole which opened up in Eccles, around 5pm on Monday afternoon. It is said to be 6-9m deep going beyond the road and pavement, around 1.2×1.2m in size. With fears that the pavement could open up further, Trafford Road remains closed in both directions. Sinkholes are formed when the land surface is changed, causing the material to collapse and sink. It happens when acidic water dissolves the rock underneath the ground eliminating a stable platform. 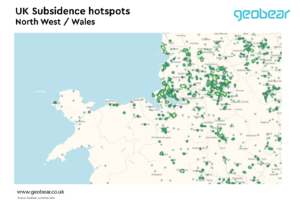 This image locates the hotspots for sinkholes over Wales and the North West. To look at sinkhole hotspots all over the UK click here. If you want to know if your property or land is susceptible to sinkholes you can order a Terrafirma search from Pali by calling 0800 023 5030 or contacting us here. This entry was posted in Conveyancing, environment, Local News, Property Market and tagged Conveyancing, ground, Ground Stability, hole, Pali, Property, roads, sinkhole, Solicitors, Terrafirma, UK. Bookmark the permalink.